A Wisconsin firm is voluntarily recalling two limited batches of Vital Essentials Frozen Beef Tripe Patties and Frozen Beef Tripe Nibblets. The Federal Food and Drug Administration (FDA) tested product and alerted Carnivore Meat Company that the product tested positive for Listeria, a bacteria commonly found in soil and water and some animals. While Listeria can cause illness for humans and some animals, according to the FDA it is actually rare that dogs become ill from Listeria. No other product manufactured by Carnivore is involved in this voluntary recall. 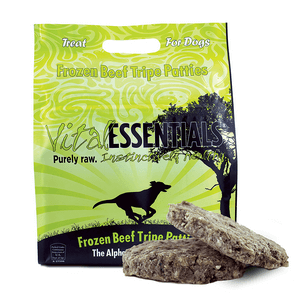 The lots involved in this voluntary recall are: Vital Essentials Frozen Beef Tripe Patties, UPC 33211 00809, Lot # 10930, Best by date 20160210 Vital Essentials Frozen Beef Tripe Nibblets UPC33211 00904, Lot # 10719, Best by date 12022015 The "Best By" date code and lot # is located on the back of the package. The affected product was distributed in WA, CA, TX, GA, IL, CO, NM, FL, PA, RI, OH and VT. 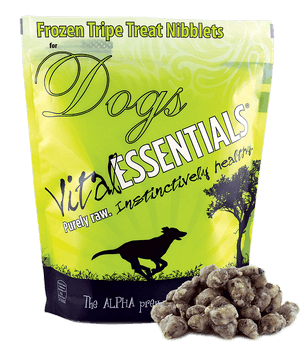 If you are a consumer and have purchased a bag of Vital Essentials Frozen Beef Tripe Patties with the "Best By" date code of 20160210 or a bag of Frozen Beef Tripe Nibblets with a “Best By” date code of 12022015, we ask that you please call 920-370-6542 Monday-Friday 9:00AM-4:00PM CST and someone will assist you in obtaining replacement or a full refund from your local retailer for your original purchase. If your package has been opened, please dispose of the raw food in a safe manner by securing it in a covered trash receptacle. Our Commitment to Quality The company is fully committed to maintaining the highest quality standards in the pet food industry and ensuring the health and safety of pets. The firm’s quality control and quality assurance programs include, but are not limited to: Good Manufacturing Practices (GMP's), Sanitation Standard Operating Procedures (SSOP's), a Hazard Analysis & Critical Control Points (HACCP) program, regular lot segregation, and other industry best practices. •Frozen Duck Duck Goose Dinner Morsels for Dogs, 4 pounds, UPC 186011001394 with a best use-by date of 4/21/2016. •Frozen Chewy’s Chicken Dinner Morsels for Dogs, 4 pounds, UPC 186011001387 with a best use-by date of 4/21/2016. Retailers and consumers can find the full product recall list at http://www.stellaandchewys.com/stella-chewys-recall-notice/.